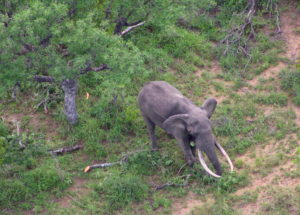 Sadly, Kruger elephant poaching is becoming a grim reality, not only within Kruger but all over South Africa. A total of 67 elephants were killed for their ivory in the Kruger Park in 2017, while one was lost to poachers in KwaZulu Natal (KZN). If one looks at the trend, Kruger losses are significantly worse: 2013 = 0; 2014 = 6; 2015 = 30; 2016 = 46; 2017 = 67. This emerging threat needs to be addressed urgently and ahead of the curve to prevent the escalation in poaching as seen for rhino. Although the numbers of poached elephant will have little impact on overall elephant numbers at this stage, given that a minimum of 17 086 elephants were resident in Kruger in 2015 (census data), authorities should be alert to the danger of elephant poaching rapidly escalating. In the past, elephant poaching in Kruger was largely regarded as opportunistic, carried out by poachers looking for rhino but unsuccessful in their search. Another factor may be that there are less rhino in the north of the park where elephant poaching is taking place. Rhinos are still the preferred target for poachers. Weight for weight, rhino horn commands a higher price on the black market and are easier to remove, conceal and transport. The Great Elephant Census recently revealed that the African elephant population declined by 144 000 animals in just seven years (2007-2014). The vast majority of elephants killed were to illegally supply ivory markets in Asia. At this rate, this great African icon could disappear from the wild within our lifetime. It is however encouraging to note that some progress has been made in recent years. The Convention on International Trade in Endangered Species of Wild Fauna and Flora (CITES) recent figures indicate a decline in elephant poaching for the fifth year in a row, and in East Africa poaching rates are back to pre-crisis levels. China’s recent ban on ivory trade will hopefully curb the demand significantly, but there is certainly no time for complacency. The Giants Club Summit held in Kasane, Botswana, recently, hosted by President Ian Khama, aimed to unite African leadership with global science and finance leaders to accelerate anti-poaching efforts and to close ivory markets, as well as to fund wildlife habitat protection. 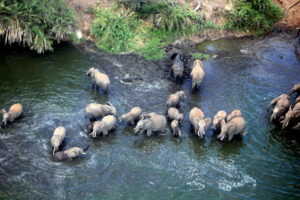 Their ultimate goal is to protect the remaining 415 000 African elephants by 2020. 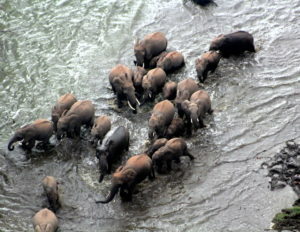 Other key objectives of this initiative are to build new partnerships between Africa and China, to secure Africa’s largest single remaining contiguous elephant population in Southern Africa, to promote corporate social responsibility as a way forward in funding conservation as well as to set transparent and achievable goals to be met before the next Summit. Conversely, although China has been the largest importer of illegal ivory, the gains resulting from its ban on all domestic ivory trade and processing could be short lived, experts warn. They warn that the ban has driven up demand for tusks, horns and other endangered animal products, opening up new markets in Laos, Thailand, and Vietnam. Law enforcement against this trade in the South East Asian countries remains weak, creating gaps for smugglers in areas controlled by terrorist groups such as al-Shabaab and the Lord’s Resistance Army in Uganda. This raises fears that sales would raise demand in both China and Japan where most auctioned ivory was purchased.